your dock area along the side pads. inclined driveway to your building. match the angle of your driveway. A 4" wide contrasting guide stripe is sewn on. Determine (measure) your inclined driveway to establish the amount of driveway rise and your driveway length. therefore the actual bumper necessary would be 9". chart is designed to leave the top of the truck approximately 6" from the building wall when the truck is fully docked. measured length. 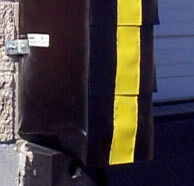 Dimensions A, B & C are the recommended sizes of your dock bumpers and your dock seal taper. Dimensions B & C will be used in the price tables below to order the actual correct dock seal model #. projection) of 12" with foam side pads which taper from 16" at the bottom to 10" at the top. of 8' the model # for the standard heavy duty seal is T-1THD/P16/SQ-12/T1610/8WX8H. 4. Add desired special options from below. our contact page and we will confirm your dock seal selection. 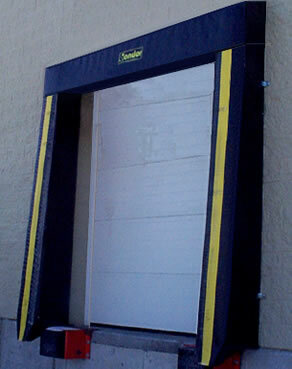 with Optional Wear Pleat Surface 8"
Seal with Optional Wear Pleat Surface 4"
RI, to fit a door opening of 8' wide x 8' high. Pads to be wrapped with 40 oz. vinyl coated nylon.